Headpins! They are to the Jewelry Industry what Nails are to the Construction and Horseshoe Industry. Nothing stays in place without them! 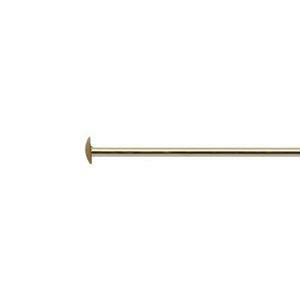 The GF5204 – a 14/20 Gold Filled 1.5 inch 24 gauge .055 inch Headpin. “For the want of a nail the shoe was lost, For the want of a shoe the horse was lost, For the want of a horse the rider was lost, For the want of a rider the battle was lost, For the want of a battle the kingdom was lost, And all for the want of a horseshoe-nail.” - Benjamin Franklin. Don’t lose your jewelry kingdom for the loss of a headpin! one of our bestselling gold filled findings.